A Kooler Design Studio sentimental favorite by designer Sandy Orton. 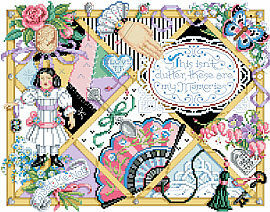 Sandy’s specialty is bringing many elements together into delightful and detailed samplers. This design is no exception. The sentiment of “This isn’t clutter, these are my memories” will resonate with many of us who cherish our heirlooms and lovely possessions. Contents: Stitch Count is 193w X 151h Finished size on 14ct 14" x 11"